Did you know January 23rd is National Handwriting Day??? Come join us at The Art Store to celebrate! Test materials at our in-store demo station and take home some handwriting supplies to play with! Handwriting can be as personal as a fingerprint and as expressive as a dance. Celebrate National Handwriting Day with us; consider January—and the new year—as a chance to get back to the rhythm and flow of writing! Join us January 23rd as we celebrate this day! All of our handwriting and calligraphy supplies will be 25% off, including all caligraphy pens – dip cartidge or felt tip chissel; ink for dip pens, and select pads of paper, namely bullet journals and calligraphy lined practice paper! Plus, you can test out handwriting supplies at our demo test station featuring Strathmore bristol cards! Handwriting exercises a complex cognitive process involving neuro-sensory experiences and fine motor skills. By feeling the writing surface, holding the writing instrument, and directing precise movement with thought, you give your brain a full workout! In contrast, typing is a simple, memory-based movement. Executing key strokes is just a repetitive movement. Research shows that children who practice their handwriting have higher levels of literacy and cognitive development. This is likely because as children learn how to quickly translate mental images of letters into a physical form, they begin to understand how letters form sentences and meaning. Strong writing skills also improve reading comprehension. Writing notes by hand helps you retain knowledge more than typing. Writing and drawing by hand increases creativity because we are forced to slow down, consider the big picture, and come up with creative ideas. Check out more about handwriting VS typing on this infographic! Ways to Celebrate National Handwriting Day, with supplies you can get at The Art Store! While on every other day of the year we turn to our keyboards and smartphones, let’s use National Handwriting Day as a chance to dust off the old pen or pencil and get writing. There’s nothing quite like receiving a handwritten letter or card in the mail and unfortunately, this is becoming a lost art. But National Handwriting Day is the perfect time to revive this tradition! First, make a list of all the friends and family you want to reach out to. Next, pick up some simple postcards or custom stationery and think about the message you want to write. Maybe you want to include some fun past memories, a handwritten poem, or an update on how your life has been. No matter what you write, the recipient is sure to appreciate the effort and you will be practicing your penmanship at the same time! We suggest using Strathmore creative blank cards to include your own art with your handwritten note! Our art cards can be embellished with pen, ink, pencil, watercolor, collage, stamps, markers, acrylic and so much more! Whether you’re on a call, sitting in the waiting room, or just lounging on the couch, doodling is a great way to express some creative freedom and exercise your writing skills. Take your doodles one step further by expanding them into a larger sketch. Who knows, you could create your next piece of art! Even if you don’t consider yourself an artist or creative person, it never hurts to tap your inner creativity with help from pen and paper. You probably have everything you need to doodle around, but if not – we have fantastic journals, pencils, pens and all kinds of doodley stuff! You might have thought that this little hobby was left in your childhood, but adult coloring books are back (and for good reason). Coloring, which is similar to art therapy, has been shown to reduce anxiety, create focus, and encourage mindfulness. Plus, it’s fun! Grab some colored markers or pencils and start your own coloring book art piece to celebrate National Handwriting Day in style! We have thousands of pens and markers, plus a great selection of coloring books to choose from! Writers who use large letters are more likely to be outgoing, people-oriented, and outspoken, while those who use small letters might be more shy and withdrawn. Those that write rounded letters are creative and artistic, and those that write pointed letters are intelligent and curious. Big loops in letters indicate open-mindedness and the need for adventure and narrow loops might correlate to skepticism or restriction. Read more in pens.com infographic, What Does Your Handwriting Say About You? Lewis Carroll, author of Alice in Wonderland, would not only hand write his work, but he would also add beautiful doodles within. David Foster Wallace, a popular postmodernism writer and poet, added stickers to his handwritten notes! Jane Austen’s handwriting was beautiful but mostly illegible, at least to 21st century eyes. 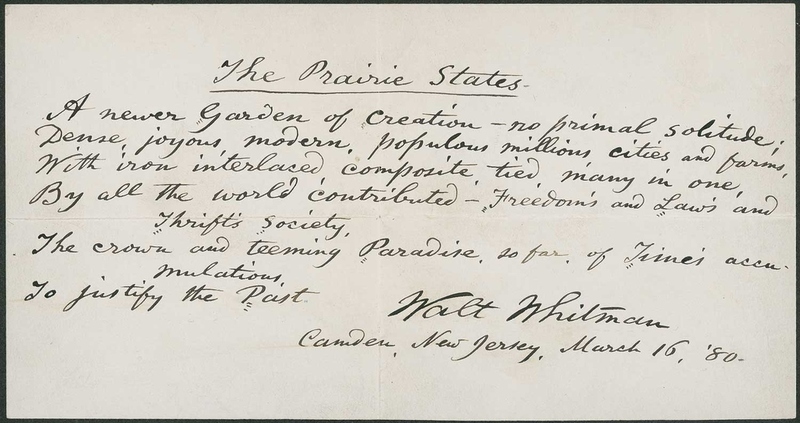 Walt Whitman, the iconic humanist, poet, and writer, had picture-perfect calligraphy. 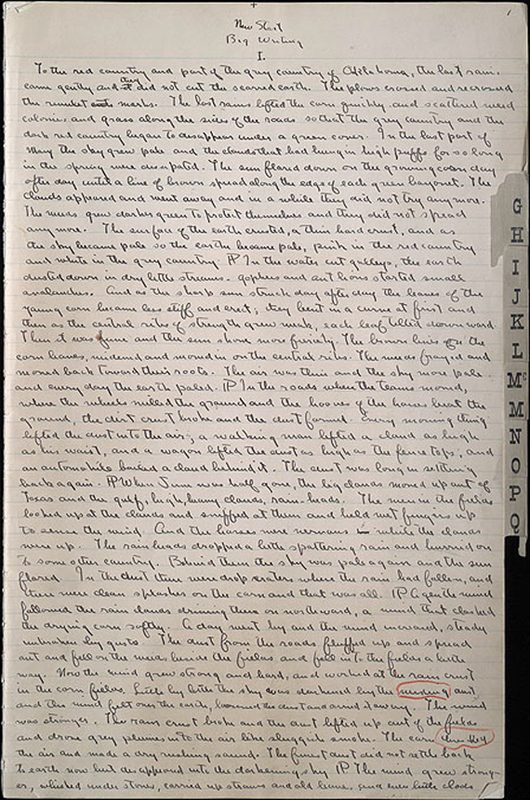 Anyone who has read Grapes of Wrath by author John Steinbeck won’t be surprised by his dedicated, disciplined, font-like handwriting. As you can tell, handwriting really tells a story about a writer’s work and style. Take National Handwriting Day as a time to celebrate this art form. National Handwriting Day also corresponds with the beginning of the year and making resolutions. A vision board is a great way to visualize your goals for the upcoming year and creating one from scratch is the perfect way to celebrate handwriting and art. Vision boards are simple to make. All you need are some old magazines, newspaper, other media, and art supplies. Find things that resonate with you, such as a person in a suit for career growth or a big salad for healthy eating, and put them on your board. Then, hand write words of motivation to finish the piece. No one said that John Hancock is the only one that can have a cool signature! Your signature serves as your personal mark on everything from checks to cards, so take time on National Handwriting Day to perfect it. Try different styles, spellings, and structures. Just initials? Full name? Larger first letter? The possibilities are endless. Our calligraphy and writing pens, nibs and sets are fabulous! We carry Manuscript and Speedball writing instruments and a huge variety of ink for your writing pleasure. Dream journals are a way to keep track of your dreams and are often used to find patterns in thoughts and emotions. They can be used as a springboard for a writing piece or just as a fun hobby to monitor what your brain is cooking up! First, find a journal that you love and can keep right by your bedside. Then, make a habit of recording your dreams right when you wake up. Even if they are just fragments of memory or emotions you felt, starting the habit is key to dream journaling. You might be surprised with what you come up with! Ryan Hurb at Dream Studies explains his process for dream journaling. Handwriting is more than just a tedious task we learn in school. It is a window into our unique personality, an instrument of creativity, and a brain exercise! Celebrate National Handwriting Day this year with some fun, stress-free writing time, art, or journaling. We have some really great journals, from Moleskine to Strathmore vision journals! They accept everything from pencil to watercolor to mixed media. However you want to celebrate National Handwriting day, we salute and support you! In this digital age it’s important to keep our hands in touch with paper and pen. Enjoy!